To longtime residents Carolyn and Tony Scott, Redmond’s downtown shift toward density and walkability is a welcome evolution. 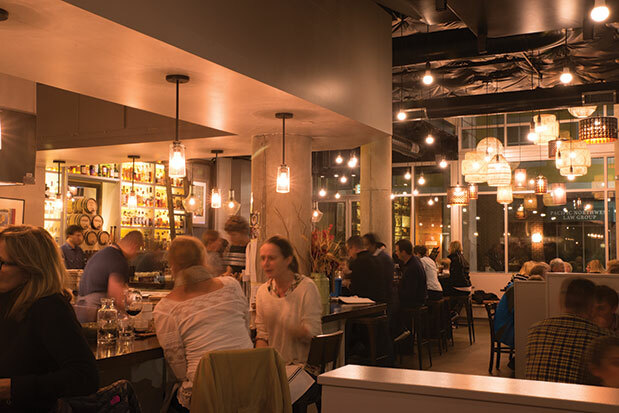 The couple has spent close to 20 years dreaming of their own restaurant, and last March they opened Woodblock on the now-vibrant few blocks where Cleveland Street intersects with Redmond Way, which is packed with new restaurants. Woodblock prints adorn the walls, and pendant lamps swing from tall ceilings. Chef Savuthy “T” Dy is in the kitchen. His experience ranges from interning at The Herbfarm to acting as culinary director of Tacolicious in San Francisco. Dy was raised in Kirkland and shares the Scotts’ Eastside pride. He also understands the area’s sensibilities. Although the menu reads as safe and standard—you’ll notice mac ’n’ cheese, roasted cauliflower, glazed wings, the requisite burger—there’s an unexpected complexity in the flavors. That mac is actually fat rigatoni, accented with bold hunks of blue cheese, aromatic with truffle oil and benefiting from the tart crunch of the tiniest matchstick apple slices. The cauliflower is combined with mint and cumin and golden raisins, giving it a decidedly Indian flavor. Dy’s favorite dishes are among the best: tender octopus (a braising technique he picked up from a chef in Mexico City) and delicate gnocchi (which he learned to make while working in Italy), refined by his experience in the kitchen with Seattle chefs Lisa Nakamura and Ethan Stowell. Bryce Sweeney manages the bar, where barrel-aged cocktails are highlights. Cleveland Street isn’t done developing—more shops and restaurants are surely coming—and we hope Woodblock evolves right along with it.